What is “Normal” in my vision? Myopia is a condition in which near objects are seen more clearly than objects which are far away. For more information on Myopia, including an animated example of the condition, please click here. Extra effort is required to try to clear the focus at all distances, resulting in eye strain and fatigue. This “strain” can manifest itself as headaches after close work, blurred near vision, tired eyes, difficulty adjusting focus from distance to near and near to distance, avoiding close work and short attention span for near tasks. For more information on Hyperopia, including an animated example of the condition, please click here. Astigmatism is an out-of-roundness of one or more surfaces in the eye’s optical system. For more information on Astigmatism, including an animated example of the condition, please click here. This is caused by a natural hardening of the eye lens, so that by the early 40’s it does not respond as well to the muscles intended to change the focus of the eye. As a result, people in this age group start to have difficulty with near tasks like reading small print, threading a needle, etc.. This is especially true at the end of the day when lighting levels are poorer and the individual is more likely to be tired. Correction consists of reading spectacles, bifocals or the newer progressive lenses. For more information on Presbyopia, including an animated example of the condition, please click here. For more information on Macular Degeneration, including an animated example of the condition, please click here. For more information on Amblyopia, including an animated example of the condition, please click here. For more information on phorias, including an animated example of the condition, please click here. For more information on Glaucoma, including an animated example of the condition, please click here. The eventual “cure” is surgical removal of the lens with cataract and replacement with an artificial lens (intra-ocular lens implant). For more information on Cataract, including an animated example of the condition, please click here. Refractive surgery is best suited for patients who wear spectacles or contact lenses all the time. Most patients do not need spectacles for general wear after the surgery but it is likely that a prescription will often be needed for fine work or as focussing problems (presbyopia) develop naturally in the 40’s. Cost is an important factor: laser surgery costs up to $2000 per eye and is not covered by Medicare or any other private health fund (though in some cases it is partially tax deductible). Most laser clinics offer finance plans or interest-free terms. While laser techniques in refractive eye surgery have been years in the making, only in this decade has laser surgery become truly widespread. It is estimated that up to one and a half million people worldwide had such operations, many thousands of those in Australia. 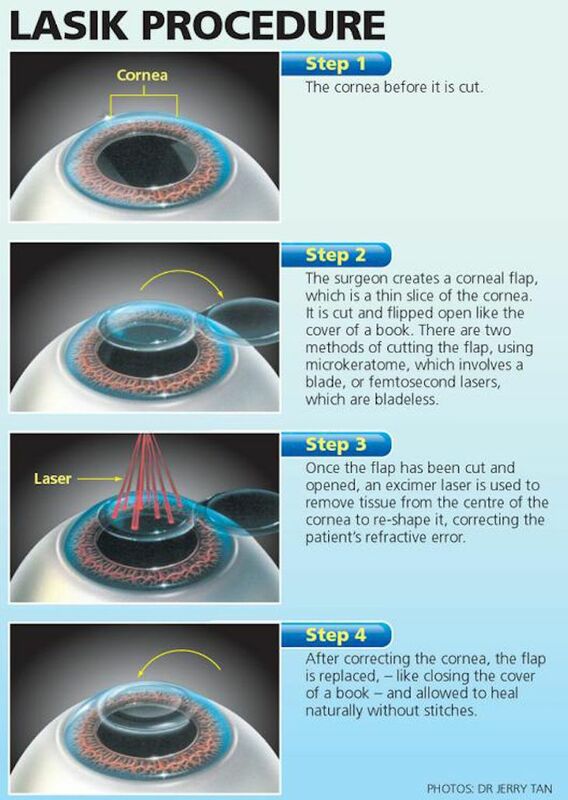 Reputable eye surgeons emphasise that not all laser patients will attain 20/ vision. This depends on various factors, including the severity of the patient’ original vision problem. Some patients may still require glasses or after laser surgery. Those with presbyopia or “ageing eye” which often occurs in one’s early 40’cannot generally be treated by laser surgery, although in some laser treatment may be used for one eye only. For more information on Colour Blindness, including an animated example of the condition, please click here. What is “Normal” for my vision? After a relatively stable time in the 20’s and 30’s another significant time for change begins in the 40’s. This involves a gradual loss in the ability to finely focus the lens inside the eye. The result is a totally normal and expected change called “presbyopia”, which continues into the 60’s. After 60, the eye will tend toward less long-sightedness or more short-sightedness as the inner part of the eye lens hardens. Sensitive vision drops and the retina’s fine discrimination of colours is dulled. By 70 most eyes show signs of cataract and the older, harder, clouded eye lens scatters light so that glare often becomes more of a problem.